A chemical compound is a substance which is formed from identical molecules made of more than one element which are bonded together. There are four types of chemical compounds: molecules bonded through covalent bonds; ionic compounds; intermetallic compounds, and specific complexes. Compounds are always the result of a chemical reaction and always have a unique chemical composition. Compounds that mainly contain hydrogen and carbon are referred to as organic compounds. Most of these compounds are held together by covalent bonds. A good example of an organic compound is glucose. Any compound that is not organic is referred to as inorganic – a good example is water. Molecules which are bonded through covalent bonds are considered to be compounds. Covalent bonds form between gas or liquid molecules when they are at room temperature and have a low polarity. This bonds forms between two non-metal molecules that have similar electronegative values – each molecule ‘shares’ its electrons to form a stable bond. Each atom involved in the covalent bond contributes one atom each to form a shared pair. Covalent bonding involves interactions of the pi and sigma orbitals, and as such, often lead to the formation of single, double, triple, and quadruple bonds between atoms. Additionally, it is important to know that whenever a covalent bond is formed between two atoms, energy is released – this makes the molecule more stable. Atoms will form as many bonds as they possibly can to become more stable, as long as this action is energetically profitable. Ionic compounds consist of a metal and a non-metal bonded through an ionic bond. These bonds form between solids at room temperature and have very high polarity. This type of bond is formed through the electrostatic attraction between two ions of opposite charge. As such, is involved the complete transfer of valence electrons. Atoms that lose one or more electrons are called cations. Atoms that gain one or more electrons are called anions. 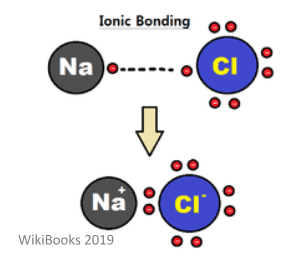 This form of bonding acts to satisfy the octet rule – this is a rule that states atoms are most stable when their valence shell has 8 electrons in it. This bond doesn’t have direction, and so the compounds made tend to exist as crystal structures. These structures have both high melting points and high boiling points. The higher the charges are, the stronger the forces and the higher the melting point will be. They also show good electrical conductivity when they have been melted. Ions will also combine in such a way that means the overall compound will be neutral (i.e. no charge). This means that the charges of each ion must balance each other out. Intermetallic compounds are solids which contain two (or more) metallic elements. Also, these compounds can also include other non-metallic elements if their structure is different from the other constituents of the compound. The quantity of each element found in a compound has a fixed ratio – this is what makes compounds unique. This means that if you change the ratio of elements, you will make an entirely different compound. For example, water has a fixed ratio of elements – 2:1 of hydrogen atoms to oxygen atoms. These ratios are expressed as chemical formulas, so in this case, H2O. The main difference between a compound and a mixture is that mixtures do not have a fixed chemical composition. Additionally, the formation of a mixture requires no chemical reaction. This means that the substances in a mixture are not changed and can be separated from each other without the need for a chemical reaction – this can be done through methods such as filtration or evaporation. Due to the ratios of elements being variable in a mixture, the properties of mixtures can vary greatly – this depends on the composition. Also, no energy is involved during the creation of a mixture.